June | 2014 | In Domino Spera! Ps 104 R/. Lord, send forth your Spirit, and renew the face of the earth. 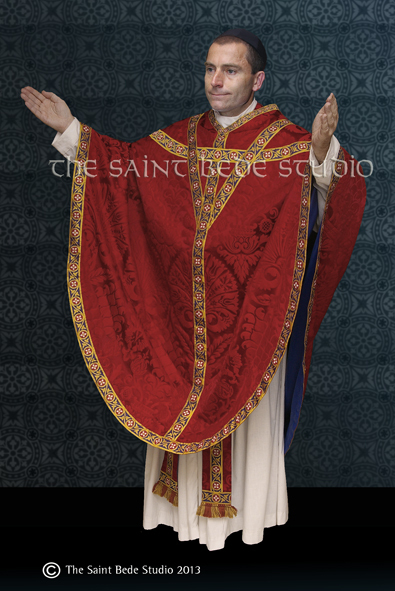 “Chasuble of S’ Thomas Becket”, by The Saint Bede Studio (http://saintbedestudio.blogspot.ca/2013/09/chasuble-of-s-thomas-becket-3.html). This copyright image may not be reproduced without permission. I think that of all the liturgical colours of the Church, red is my favourite. It’s my favourite because it’s a vibrant, powerful and bold colour; a passionate colour that evokes two equally bold and powerful things: fire and blood. Fire is powerful and passionate; it’s alive, and in a sense, it’s zealous: it always seeks to grow, to spread. But fire isn’t just a force of destruction; it’s only destructive when it’s wild and uncontrolled. When it’s controlled and tempered, fire is actually a force for good, because it purifies and strengthens. Fire purifies by burning away impurities, junk that contaminates. We see this most clearly in how refiners use fire to purify metals by burning away the dirt from the precious metals, to leave behind only what is pure, perfect and precious. Fire also strengthens. A blacksmith uses fire to soften metal so that he might shape it, bend it, and fold it, making it stronger and fit for a variety of uses. Fire purifies and strengthens. Blood, too, is passionate, because it carries life: our bodies need blood to function; without it, we die. And so blood represents life and carries with it a sense of sacredness. That’s why, in the Old Testament, animal blood was poured out in sacrifice (oblation) to God to represent the offering of life. And that’s precisely the meaning Jesus gave it at the Last Supper: Take this all of you, and drink from it, for this is the chalice of my blood… which will be poured out for you … for the forgiveness of sins (Words of Institution). In other words: ‘Take my life, O God, that they may have life and have it in abundance’ (cf. Jn 10:10). The Martyrs of the Faith deeply understood this reality, that’s why they found joy in offering their lives, in shedding their blood for God in imitation of our Lord. There can be no greater offering than giving one’s own life to God out of love for Him (cf. Jn 15:13). Blood is life and passion. Fire and blood — purification, strengthening, life and passion —: this is what the colour red symbolises, and it’s not just my own sentimental interpretation; it’s the very reason we use the colour red for the feast of martyrs and for the Solemnity of Pentecost, which we celebrate today, because the Holy Spirit is ‘fire’ and ‘blood’. As the Acts of the Apostles recount in the first reading, the Holy Spirit descended on the Apostles as tongues of fire, flames resting on each of them (Acts 2:3), because the Holy Spirit, like fire, purifies and strengthens! The Holy Spirit, whom we received at Baptism, softens and shapes us as fire does steel, and if we abandon ourselves to His grace, He also purifies us as one refines silver and gold. But just like fire burns, so also the Spirit’s work in us is at times painful, because we really do need to be purified. We need to allow the Holy Spirit to reveal to us the imperfections we carry, and then allow the fire of His grace to burn them away. And this is often painful, because it means letting go of things: it means letting go of our sins and changing our ways and our minds; in some cases it means letting go of certain friends or activities; it means growing in faith and love. But the rewards are far greater than its pain! The more we’re purified, the closer we get to the Lord, the more intimate we become with Him; and that’s precisely what it’s for! As the silversmith melts ore in fire to burn away the impurities and reveal the beauty and value of the silver, so too the Spirit burns away our impurities so that our beauty and value as children of God is made more and more visible. But this process takes time. Like silver, we can’t take the whole process of purification in one shot; it has to be carried out gradually, allowing the impurities to burn away at successive degrees, beginning first with the big stuff, and then with the smaller stuff. But I’ll warn you: the closer we get to Christ, the more imperfections we notice in ourselves. But this shouldn’t lead us to despair, because it’s a sign of progression, a sign that the process of perfection and growth is working! And as the silversmith knows that the silver is ready when he can see his own reflection in it, so also will the Holy Spirit have accomplished His work of purification when we perfectly reflect the image of Christ in our lives. And that, my brothers and sisters, is the goal of the Christian life: to become the perfect image of Christ. And the role of the Holy Spirit is to purify us into living icons of Christ, and to strengthen us in that journey so that we might better and more joyfully reflect this image to all those around us. This is what we mean by ‘holiness’, and it’s to this that each of us have been called by Baptism. The goal of following Christ is to become like Him: discipleship means imitation, and the Holy Spirit is the One who teaches and helps us to imitate the Lord. That’s why the He’s ‘fire’. But the Spirit is also blood. As flowing blood is the sign of life in the body, so too is the Spirit working in us the sign of spiritual life. And as blood is the bond between family members, so too is the Spirit the bond that unites us as members of the Church, brothers and sisters in Christ. The gift of the Spirit at Baptism enters into us as the spiritual life-blood of our relationship with God and with each other: we belong to God because His Spirit dwells in us, and we belong to each other because we share the same Spirit. This is renewed and strengthened in us through the Sacrament of Confirmation, where we’re ‘strengthened’ — ‘confirmation’ means ‘strengthening’ — with the Spirit for the prophetic role of service and mission to the world, because our sanctification in the fire of the Spirit isn’t just for ourselves: it’s also with and for others, those in the Church and those outside her embrace. And so this life in the Spirit is meant to be shared, and shared joyfully! The experience of being purified and strengthened by the Spirit (in being sanctified) is Good News! And so the life we receive from the Spirit is one of evangelisation and zeal; it’s meant to send us out to the ends of the earth to proclaim the Good News of Christ Jesus: Receive the Holy Spirit, as the Father sent me, so I send you (Jn 20:22, 21). The Holy Spirit isn’t a secret to be kept, but a joy to be lived and shared. 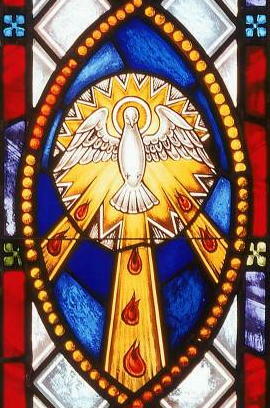 My brothers and sisters, as we rejoice today in the Solemnity of Pentecost, may we abandon ourselves to the fire of the Holy Spirit, allowing Him to purify and strengthen us, to renew in us a share in His divine life so that we might bring Christ to all nations, and all nations to Christ. Amen. Pentecost, by Duccio Di Buoninsegna (1308-11). Located in the Museo Dell’Opera Del Duomo, Siena, Italy. V/. Send forth your Spirit and they shall be created. R/. And you shall renew the face of the earth. Amen. This is a multi-part series honouring the Vatican Council II by reviewing its documents. We continue with a review of the Constitution on the Sacred Liturgy. “Holy Mother Church is conscious that she must celebrate the saving work of her divine Spouse by devoutly recalling it on certain days throughout the course of the year. Every week, on the day which she has called the Lord’s day, she keeps the memory of the Lord’s resurrection, which she also celebrates once in the year, together with His blessed passion, in the most solemn festival of Easter. “Within the cycle of a year” — organised as Seasons: Advent, Christmas, Lent, Easter, Ordinary Time — the Church “unfolds the whole mystery of Christ, from the incarnation and birth until the ascension, the day of Pentecost, and the expectation of blessed hope and of the coming of the Lord. “Recalling thus the mysteries of redemption, the Church opens to the faithful the riches of her Lord’s powers and merits, so that these are in some way made present for all time, and the faithful are enabled to lay hold upon them and become filled with saving grace” (no. 102). With these words from the Council Fathers, we come to see the purpose and structure of the Liturgical Year: to yearly (and weekly!) recall and relive the Paschal Mystery and the salvation Jesus has brought us. While the yearly cycle hinges on Easter, the weekly cycle hinges on Sunday. It’s for this reason that attendance at Mass is an obligation on all Sundays – they are understood to be ‘mini’ Easters. 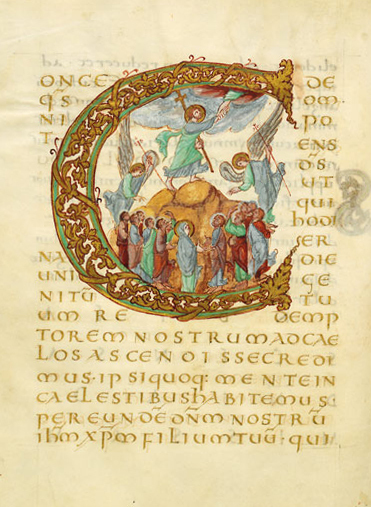 “For on this day Christ’s faithful are bound to come together into one place so that, by hearing the word of God and taking part in the Eucharist, they may call to mind the passion, the resurrection and the glorification of the Lord Jesus, and may thank God who ‘has begotten them again, through the resurrection of Jesus Christ from the dead, unto a living hope’ (1 Pet. 1:3). Hence the Lord’s day is the original feast day, and it should … become in fact a day of joy and of freedom from work. Other celebrations, unless they be truly of greatest importance, shall not have precedence over the Sunday which is the foundation and kernel of the whole liturgical year” (no. 106). Illumination from the Drogon Missal (Metz), ca. 845-855. We celebrate today the Solemnity of the Ascension of the Lord, the feast of the “the final act of our redemption” (JPII), whereby Christ returned to the Father to prepare a place for us (Jn 14:1-3). You see, the Ascension is really the culmination of the Incarnation. Jesus took up our flesh and our nature so that He might unite it to God. In the Ascension, Jesus brings that very nature and flesh into the presence of God for all eternity. In Baptism, we were joined to Christ, we were made members of His Body; that means, then, that Jesus brought us into Heaven with Him as He ascends to the Father. Think about that for a moment! Through Baptism, we already have a share, even now, of Heaven! As we reflect on this great feast and mystery, I want to share with you some of Saint Pope John Paul II’s thoughts from a homily he gave for the Ascension (24 May 1979). Reflecting on the readings associated with this feast, he found that “the richness of this mystery” can be summarized “in two statements: Jesus gave instructions, and then Jesus took his place” (JPII). I want to focus on the first statement, ‘Jesus gave instructions’. In the days that followed the Resurrection, Jesus helped the Apostles to understand what had taken place over the first Holy Week, why He had to suffer and die, and what He had taught them. Now, in His last moments on earth, Jesus commanded the Apostles to be [His] witnesses … to the ends of the earth (Acts 1:8), and to make disciples of all nations (Mt 28:19). Jesus gave them, and through them, the whole community of believers, the Church, the mission to share the Gospel, to evangelize the world. He instructs (commands) us to continue His mission! But, as St. John Paul II wisely points out, “The instructions indicated, above all, that the Apostles were to wait for the Holy Spirit, who was the gift of the Father [cf. Acts 1:4]. From the beginning, it had to be crystal-clear that the source of the Apostles’ strength is the Holy Spirit. It is the Holy Spirit who guides the Church in the way of truth; the Gospel is to spread through the power of God, and not by means of human wisdom or strength” (JPII). My brothers and sisters, our mission to share the Good News of Jesus Christ with the world is rooted not merely in our own encounter with Him and the joy that this relationship brings us, but more importantly, it’s rooted in the gift of the Holy Spirit, the Spirit that we received in Baptism and Confirmation. It’s the Holy Spirit who gives us the zeal, the joy, the wisdom, the courage, the fidelity, and the words that we’ll need — when we need — to fulfill this mission of evangelisation, this mission of proclaiming Christ to the world. “Like Jesus, [we, too, are] to speak explicitly about the Kingdom of God and about salvation. [We, too, are] to give witness to Christ to the ends of the earth. The early Church clearly understood these instructions and the missionary era began” (JPII). My brothers and sister, we — you and I, today! —, we need to rediscover this missionary era! This is what the Church means when she speaks of a time for a ‘new evangelisation’. We need once again to proclaim the Good News and salvation of Jesus Christ, each one of us! But if we’re to do that, then it means that we ourselves first need to rediscover this beautiful gift. We ourselves first need to be renewed in the love and mercy of God, and re-strengthened with the gift of the Holy Spirit. And this isn’t an ‘optional’ part of being a disciple of Christ! If we truly believe what we profess by coming to Mass; if we truly believe what we say in the Creed; if we truly believe that Jesus is our Lord and God, and that He saves us by His Body and Blood, then we have a moral and religious obligation to share that salvation with others, because God wants all to be saved (1 Tim 2:3-4; cf. 2 Pet 3:9). We believe because we believe it to be true; so if it’s the truth, then how could we ever keep it to ourselves?! And so, with this command to preach the Gospel, Jesus shares His mission of saving the world with the Church, with each one of us who follow Him. 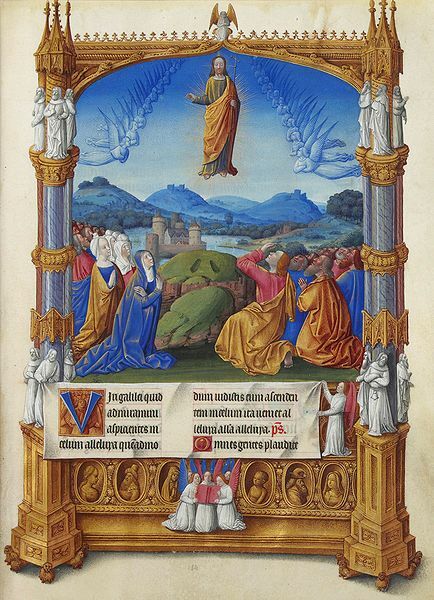 “The Ascension”, illumination from Les Très Riches Heures du duc de Berry, Folio 184r at the Musée Condé (Chantilly), ca. 1410. First, through prayer. We need to spend time with Jesus in order to get to know Him; we need to be with Him, to speak with Him, to listen to Him. A relationship can only be built through time and conversation, so if we’re to grow in our love and knowledge of Jesus, then we need make time to pray, every day. Second, through Scripture. St. Jerome, the great Bible scholar once said, ‘Ignorance of Scripture is ignorance of Christ’. So if we’re to know who Jesus is and what He’s done for us, then we need to read the Bible. I recommend beginning with the New Testament, and then going back into the Old Testament for a deeper understanding. And since the Bible is the Word of God, reading it with prayer is a great way of discovering and listening to God’s voice. Third, through the Saints. If prayer is conversation with Christ, and Scripture is His Word to speaking to us, then listening to what the Saints have to say about their life with Jesus is like talking with His family and friends. Our knowledge of Jesus and our intimacy with Him can grow tremendously through a dialogue with the Saints, by reading about their lives and experiences, and by feeding our prayer life with their spiritual writings. And so these three things: prayer, Scripture and the Saints – these are the principal means of deepening our relationship with Jesus and strengthening our love for Him; these are the tools required for our mission of evangelization, for bearing faithful witness to who Jesus is and what He’s done for us. But of course, as St. John Paul II reminds us, all of this is rooted in the Holy Spirit working in our lives, giving us the grace to grow in faith, in love, in holiness, and increasing our capacity to be faithful and courageous witnesses in the world, for the world. This is the vocation of the whole Church, not just of the clergy, but of all the baptised. “This is the mystery of the Ascension of [the Lord]. Let us always remember: Jesus gave instructions, and then Jesus took his place” (JPII). May we be faithful to that instruction, and so come to share in the place He has prepared for us. Amen.